a. ^ English is the official language of at least 28 states; some sources give higher figures, based on differing definitions of "official".English and Hawaiian are both official languages in the state of Hawaii. 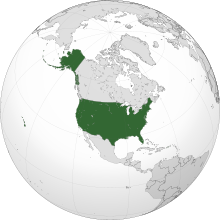 French is a de facto language in the states of Maine and Louisiana, while New Mexico state law grants Spanish a special status. Cherokee is an official language in the Cherokee Nation tribal jurisdiction area and in the United Keetoowah Band of Cherokee Indians based in east and northeast Oklahoma. c. ^ Whether the United States or China is larger has been disputed. The figure given is from the U.S. Central Intelligence Agency's The World Factbook. Other sources give smaller figures. All authoritative calculations of the country's size include only the 50 states and the District of Columbia, not the territories. ↑ New Mexico Code 1-16-7 (1981). ↑ New Mexico Code 14-11-13 (2011). ↑ Garcia, Ofelia (2011). Bilingual Education in the 21st Century: A Global Perspective. John Wiley & Sons. p. 167. ISBN 1-4443-5978-9. Retrieved December 27, 2011.